Do you often pick up a tender rotisserie chicken to pair with a salad or something for your family dinner? Have you ever once thought that it would be great, not to mention more convenient if you could just cook it at home? For those people who always want a lavish, restaurant-like food, the best rotisserie ovens can come in handy. This appliance does more than roasting chicken to perfection. Do I Need A Rotisserie Oven? Who wouldn’t want to cook rotisserie chicken at home? Foods cooked in a countertop rotisserie oven is placed through spits that rotate over a steady heat source. With this rotating motion, the food receives an even amount of heat on all surfaces, ensuring the food gets cooked all throughout. Furthermore, the food's natural flavor is preserved during roasting. It is also one of the healthiest ways to cook food because this cooking style releases fats while maintaining food’s natural juices. Also, unlike barbecue grills, rotisserie ovens can be used indoors all year-round. So, if you’re either a health buff or a food aficionado, or you just crave great-tasting roasted meat frequently, you need a rotisserie oven. Not only can you enjoy tasty food anytime, but you’ll also save a great deal of money by making your own delicious rotisserie-cooked foods at home. This type is ideal for limited countertop spaces or for those planning to use their rotisseries occasionally as it’s compact, making them easy to store away. These smaller ovens can cook meat cuts and vegetables using a metal basket. If you’re looking for a housewarming or wedding gift, this is a great option. This type seems to be the most common and popular type of rotisserie. They come in many sizes, shapes, and prices. They work great at roasting meat and keeping the savory juices intact. The main downside of this type is finding the right balance for it to work as efficiently as possible. It can be tricky to get the proper balance when setting your meat up on the spit. It also depends on the cut of meat you plan on roasting. The main difference between a horizontal and vertical rotisserie oven lies on the design and direction of the spit. In this case, the spit is vertical instead of horizontal. This design is more advantageous for some people because it eliminates the balancing act that horizontal rotisseries pose. However, with this design, the juices will flow downwards as the cut of meat spins on the spit. This creates a dilemma – the fats drain out, creating a healthy food but the flavor drains with the fats as well. 1﻿﻿.﻿﻿ Consider specific needs and preferences before making a purchase – think of the countertop space available, how frequently do you plan to use it, and what types of food you plan to cook most often. If you’re going all-meat with whole sizes, the best option would be either the vertical or horizontal rotisseries. If you have enough countertop space, those types will be convenient. Conversely, if you’re just planning to cook meat cuts and vegetables and you have limited storage space, small rotisseries would be excellent. 2. Durability – go for a brand with a solid reputation in the industry. Also, look for models with high positive reviews (like the models we’ll be presenting later) to help you ensure an appliance with a long staying power. It’d be great too if the model of your choice comes with a year-long or longer warranty. 3﻿. 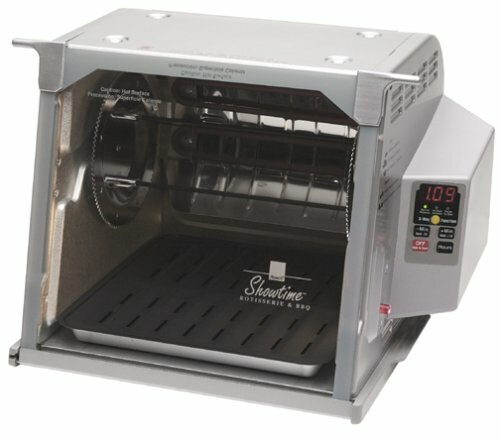 Ease of use – Generally, rotisserie ovens are easy to use. But for a tip, choose units with simple, intuitive controls that will simplify the cooking process. For greater convenience, look for dishwasher-safe models. 4﻿.﻿ Temperature – Rotisserie ovens offer various temperature settings, with the pre-set controls being the most convenient. But if you’re an experienced cook or a chef, you might want to use models wherein you can set the temperature yourself using degrees for more precision. 5. Number of spits – the more spits your rotisserie oven has, the more meat you can cook all at the same time. However, it also depends on the size of your oven. 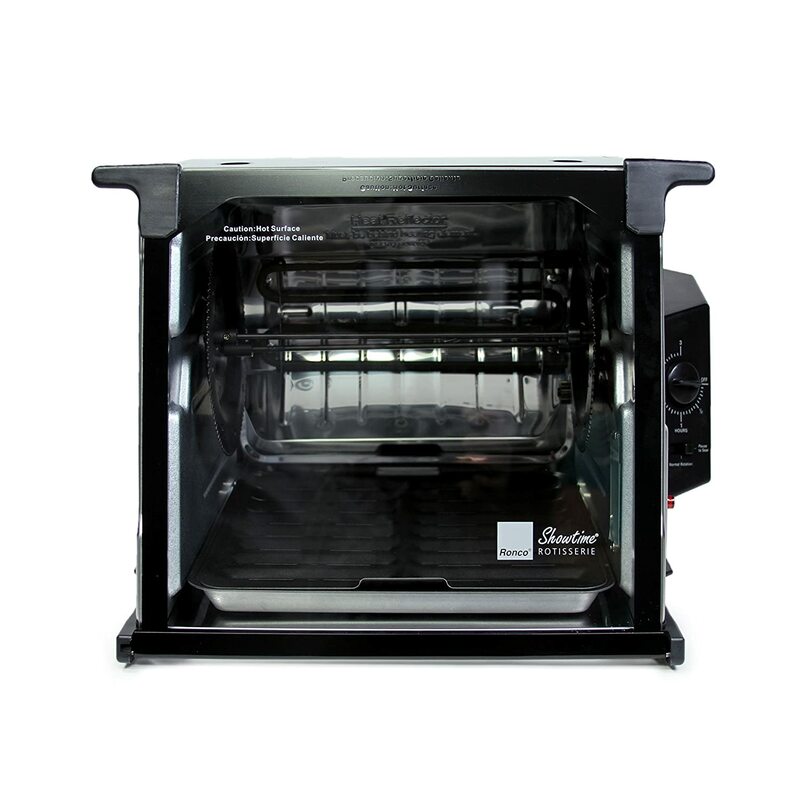 First off, this horizontal oven is very thrifty when it comes to electricity –it consumes 1/3 less energy than your conventional oven, it heats us pretty fast, and it’s tall enough to fit in most cabinets, making it our top pick for the best rotisserie ovens. You’ll also love how it features a removable heat shield that helps brown meat perfectly and stay cool handles for easy access and childproofing. It also has a non-stick surface and a removable glass door, making the entire unit a breeze to clean because all you need to do is wipe a damp cloth over the dripping juices and you’re done. However, the heat of this oven isn't adjustable, but it features three settings (normal rotation, pause, and sear) and no heat rotation that are designed to cook meats perfectly. This impressive rotisserie is ideal for cook two full-size chickens or an enormous 15-pound turkey. For barbecue parties, this machine can also fit nine quarter-pound hamburgers at one time – how effortless is that? Like our first Ronco entry, this second model is also perfect for roasting chicken, turkey, pork cutlets, and other entrees. What we admire most with this wonderful thing is its precise rotation speed that allows self-basting to ensure that it gets out moist rather than dry. The rotation also efficiently circulates heat to cause excess grease and fat to drip away – good news for health buffs, bad for those who want the flavor to be contained within the meat. Another feature we loved about this unit is its 3-Hour Automatic Timer that eliminates the guesswork. Simply set it to the correct cooking time up to 3 hours and it automatically shuts off after the allotted time with a bell’s sound. Similar to the first unit, this model also lacks an adjustable heat option but comes with three cooking settings. It also includes accessories such as a multipurpose basket, carving platform, non-stick drip tray, oven gloves, and food ties – essentially everything you need to get started. The automatically-timed Ronco 4000﻿﻿ ﻿﻿Series Rotisserie Oven will definitely light up every kitchen with its sleek appearance. Don’t be fooled by its mere appearance because there’s something more to this baby. For instance, it can cook a 15 lb. turkey, a 10 lb. ham, four salmon steaks, fifteen Italian sausages, two 5-lb chickens, up to 9 quarter lb. burgers, BBQ ribs, fish and much more! Cleaning is also easy because all the rotisserie baskets, spit rods and glass door are dishwasher-safe. Like the others, this one also features a 3-way control -- normal rotation, no-heat rotation or "pause-to-sear". The only major thing we dislike with this unit is the exterior gets very hot and burning even when your fingers are inches away from it. There are no stay-cool handles or whatever so make sure you wear mitts when using this unit and keep kids away from it. Anyone will absolutely fall in love with this oven’s unique nesting design that is meant to make storing easier because the top part is collapsible and can nest inside the bottom. It may look small, but similar to the rest of the units in this round-up, it can pretty much roast two full-sized chickens. Likewise, it also features a precise rotation speed, removable glass door, oven accessories, and a digital timer. The distinct feature of this oven is its digital display with easy-to-use, push-button operation which we greatly appreciated because almost all the best rotisserie ovens have yet to join the digital wagon. This wonderful machine offers 12 cooking functions including convection pizza, bread, toast, bake, and rotisserie roast, to name a few. You can even combine both convection and rotisserie options to evenly disperse the heat, resulting in a succulent, delicious meat. 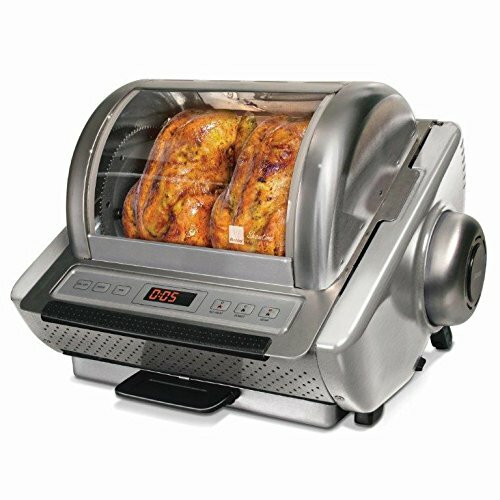 The rotisserie feature roasts up to a 4-pound chicken or 5-pound duck, exactly what you may need for yourself or a few friends, though this unit may be too small if you’re a family of four or five. 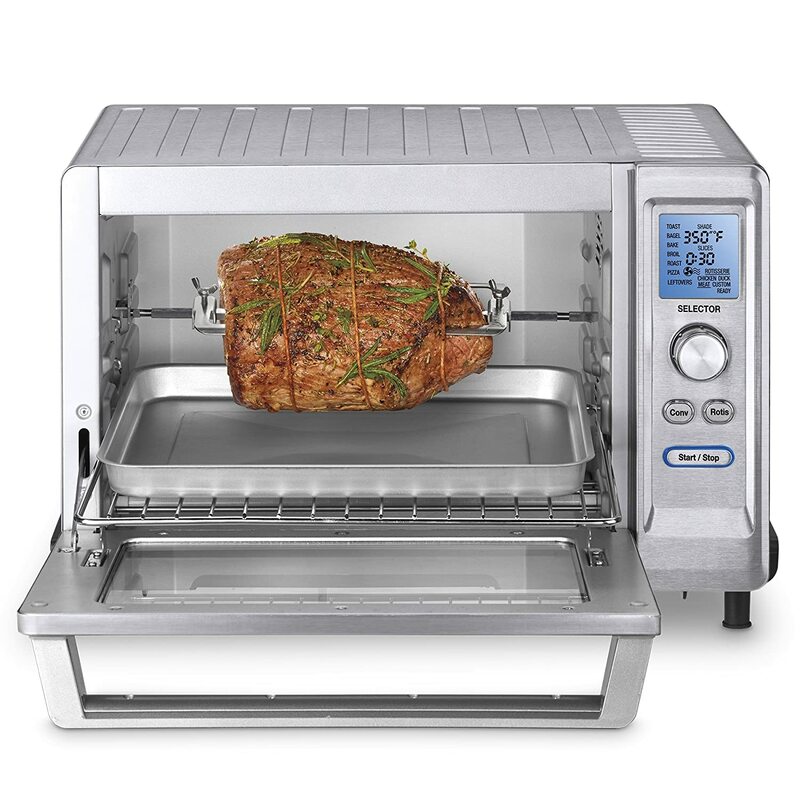 Furthermore, this baby features an exact heat sensor that maintains precise oven temperature and oven toast shade control that offers consistent juicy results slice after slice. Aside from the various cooking options this oven offers, we also loved how they have pre-set controls for bird meat types although this feature may not please home chefs who are too meticulous with cooking temperatures. 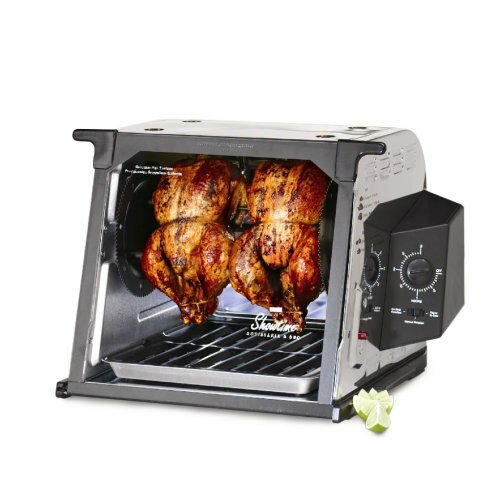 The clear winner of this roundup review is none other than the amazing Ronco Showtime Rotisserie Platinum Edition. It puts a check mark on all important things in our buying guide -- durability, compactness, ease of cleaning and operation, ability to cook multiple foods, and a simple temperature setting. Also, this machine is very thrifty when it comes to electricity, such a big plus! Hey there! What’s roasting? 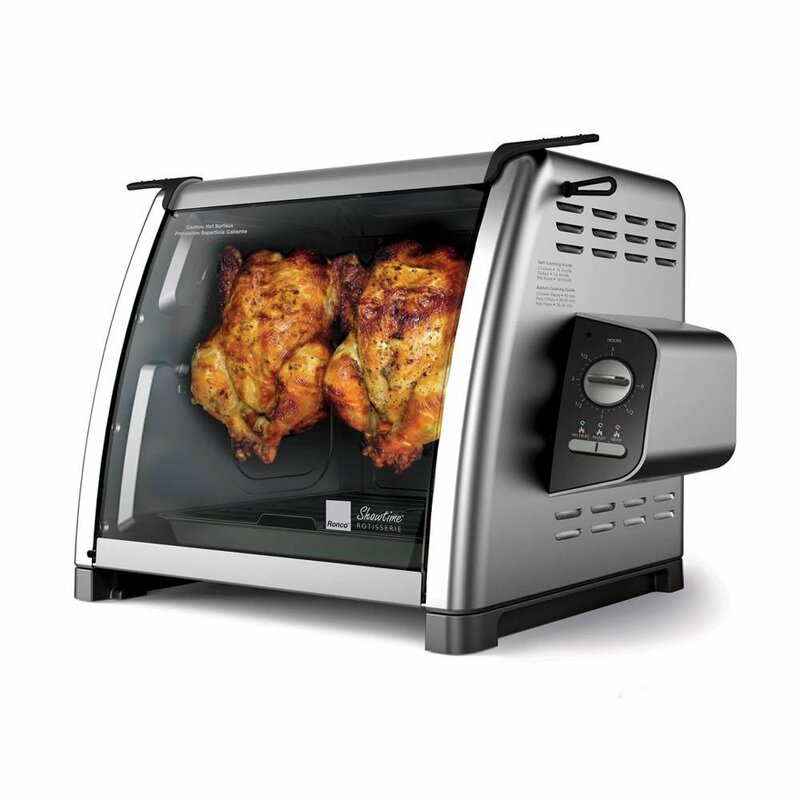 Have you used or do you own a rotisserie oven? Is it any good? Do you think we missed some great stuff on our list? Share your thoughts and suggestions in the comment section below. Don’t forget to share this post on social media. Cheers!